This page continues the "new testament" view of color that was introduced in the discussion of the basic forms of color. There I suggested that color perception is fundamentally adapted to interpret all color stimuli as arising from a three dimensional world of reflecting surfaces and light sources. "Old testament" color theory has been built upon color stimuli that methodically exclude any three dimensional visual cues or contrasts between surfaces and light sources.  chromatic induction that minimizes color contrast to produce the perception of a homogenous surface, or maximizes color contrast to improve the perception of surface patterns or separate physical objects. These continuous changes in our visual response to illuminance and reflectance maintain the experience of color as a stable attribute of objects, and minimize our awareness of changes in the intensity or chromaticity of the illumination. This produces the cognitive assurance of color constancy  the recognition of the same color in the same objects, despite enormous variations in the average luminance and luminance contrasts that represent them to our eyes. Adaptation, anchoring and contrast adjustment create the dynamic response of the visual system to real world changes in light and reflectances. The human visual system is capable of recording images across an enormous range of illumination, producing an apparently consistent picture of light, shadow and color despite changes in environmental light intensity. This is usually called light adaptation or sensitivity regulation, but I will refer to it as luminance adaptation to distinguish it from the opposing processes that take place when we move from darkness to light (light adaptation) or from light to darkness (dark adaptation). The mechanisms that accomplish luminance adaptation are not completely understood. The general goal of luminance adaptation can be described (for example, by analogy to photography), and some specific mechanisms in the eye (such as pupil contraction and photopigment depletion) have been isolated and described exactly. But these early mechanisms are only part of the story; other adjustments seem to be involved in later visual processing. The Range of Natural Light. Before delving the specifics of luminance adaptation, it is useful first to consider the range of light levels that human vision must accommodate. In everyday experience, the human eye is sensitive to two different aspects of light: (1) the total light incident on a physical surface from all light sources (the illuminance), or (2) the total light emitted from a defined image area of the visual field (the luminance). Let's use each in turn to describe our light environment. Illuminance. Illuminance measures the quantity of light that reaches a physical surface; it is commonly used to define the usable light supplied by a natural or architectural light source. Recall that illuminance (including retinal illuminance) is not directly visible: we only see the luminance of the light source viewed directly, or the luminance of physical surfaces that partially reflect the light falling on them. The illuminance in light environments is commonly measured in lux (chart, right) or foot candles (1 foot candle = 10.8 lux). As the chart shows, the human eye must cope with an enormous variation in light across natural light environments  from the illuminance of the noon sun (which can be anywhere from 60,000 to 130,000 lux) to the illuminance provided by the planet Venus or an overcast night (about 10-4 lux). The sun provides a quantity of illumination equivalent to 500 million bright planets or 400,000 full moons, yet our vision can adapt to light environments anywhere within this range. 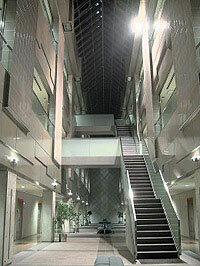 If we take modern indoor (architectural) environments as a direct expression of light preferences, then humans are most comfortable u nder illumination levels of around 100 to 1000 lux, depending on activity  100 lux for restaurants, churches or auditoriums, 300 lux for business offices, 500 lux for medical laboratories, kitchens and manufacturing areas; and 1000 lux for surgical theaters. The "white" of computer monitors is designed to simulate the appearance of a sheet of white paper illuminated at office lighting levels of about 300 lux (about 28 foot candles). Most people can easily negotiate a night environment under the light of twilight or a full moon; many people prefer to wear sunglasses in the brightest outdoor daylight. This implies a latitude of behaviorally comfortable illuminances from 10-1 to above 104 lux, or 5 log units. In many task environments eyestrain can arise when illuminance is too dim to perform detail tasks (such as reading or sewing), or the visual field includes areas that are too bright in comparison to the surround luminance. Illumination that is too bright (windshield glare, a television viewed in a dark room, sunlight reflected on open water) can cause tearing, irritation or burning of the eyes; inadequate illumination can cause headaches, double vision or blurred vision. Luminance benchmarks for physical light sources are difficult to pin down because luminance depends on how the viewing geometry is defined. (Is the luminance of the sky measured at the zenith or the horizon? Is its luminance the average over its whole area, or its peak value?) In addition, the luminance of natural light sources such as the sky, moon or sun vary dramatically according to weather, geographic location or elevation from the horizon. Independent references provide very different luminance values for the same light stimulus, and the conversion to trolands is somewhat arbitrary. The table below is my best guess for a representative selection of luminance values, laddered on the appearance of a sheet of white paper (reflectance ~90%). Here the range in values is even larger, from a lightning flash (above 10 billion candelas, or 1010 cd/m2) to the minimum possible visual stimulus (one millionth a candela or 10-6 cd/m2). At both extremes, the duration of the exposure influences visibility. The behavioral comfort zone for surface luminances, as defined by the illumination of video displays or of surfaces under artificial light, is in the range of 101 to 104 cd/m2, or about 3 log units, which is a much smaller relative proportion of the total range than is found in illuminances. This is consistent with the fact that our visual system does not adapt to the actual illuminance but adapts to the average (gray) luminance of natural surfaces  the diffuse reflected image of ambient light. The range of luminance that is visible at the same time to a luminance adapted eye also depends on how it is measured, but is generally quite large. The full moon has an apparent magnitude of about 12.5, and during a full moon nearby stars are visible only down to about magnitude 4, which is a luminance range of 2.516.5  about 1:4 million, or more than 106. 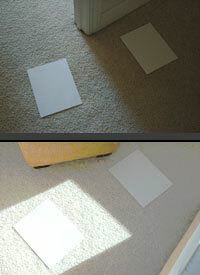 Similarly, a viewer habituated to indoor light can simultaneously perceive a white paper under noon sunlight (illuminated through a window) and dark surfaces in indoor shadows, a luminance range that is also about 106. For most purposes, however, it is more reliable to adopt the conservative value of 105 (see diagram, above right). Note that a diffusing 60W light bulb is about the brightest light source that can be looked at continuously without risk of eye damage. The connection between bright appearance and a potentially dangerous light intensity is anchored on daylight levels of illumination. A candle flame appears very bright in a dark room but is completely harmless. Lights perceived as "bright" in daylight are almost always hazardous; the setting sun, until it has turned deep orange, should be admired only in glances. The Shape of Luminance Adaptation. The basic adaptation task is to compress the enormous range of natural light intensities into a consistent (and limited) perceptual range of surface lightnesses and self luminous brightnesses. How informative are these contrasting surface and self luminous forms of color? Lightness, the relative luminance of surfaces, provides rich information about physical objects  their density, surface texture, molecular structure, mineral content, even life content. Every substance has a characteristic reflectance "signature" that includes its average refractive index, reflectance, chromaticity, homogeneity, pattern, surface texture and surface relief. Brightness, or luminance in excess of "white" surface reflectance, is much less informative. It adequately renders lights such as smoky fires, translucent or specular materials, and the moon and planets; but the dominant natural light source (the sun) is dangerous to look at. So the most informative luminance adaptation should center the best contrast discrimination on the luminance variations of illuminated surfaces, inclusive of the somewhat brighter luminance variations of filtered or specular light. A standard method for examining the relationship between stimulus luminance and perceptual response is the characteristic curve, which plots log scene luminance against linear response, as a proportion between the minimum and the maximum possible response. The characteristic curve is used to describe the density response of photochemical reaction in photographic film or the photoelectric response of light sensors, but the same curve describes the response of animal vision. The characteristic curve is fundamentally defined by the density response of the imaging medium to light, which ranges from the zero response baseline or response floor to a maximum response ceiling. Outside these limits, luminance variations are imageless. The threshold stimulus is the smallest light energy necessary to produce a just noticeable shift from the baseline (zero) response, and the saturation stimulus is the light energy that produces a response indistinguishable from the maximum possible. In photographic film, the response is the proportion or density of dye or silver halide crystals converted by light (from 0% to 100%); in the human eye, it is the total response range of the whole retina. Within this four sided space, the characteristic curve takes an "S" shaped diagonal path, inflected at the low end (the toe) and at the high end (the knee). However, as described here, the shape of the characteristic curve changes radically depending on whether log or linear units are used for the stimulus and/or response axes of the graph. Most fully illuminated surfaces (exclusive of specular reflections or directly imaged light sources) and computer monitors have a contrast ratio of about 1:20. That is, the peak "white" reflectance is rarely more than L = 95 and the "black" reflectance no lower than L = 5. (Artificial materials can achieve a range from 98% to less than 0.05%.) Daylight cast shadows reduce surface luminances by about one log unit, or 90%, amplifying the need for light and shadow contrast to something like 1:200. Modern cinemas have a contrast ratio of about 1:80, which is necessary to offset the contrast reducing effect of the dark viewing environment and to convincingly approach the actual human response range (described below). Gamma is literally the denominator e in the exponent fraction 1/e that defines a nonlinear response compression; to find e, take the reciprocal of the gamma. A gamma of 1.0 indicates a 45° slope in the semilog plot. A higher gamma defines greater contrast, but across a more limited span of luminance. A gamma value of about 2.3 (1/e = 0.43) is typical of computer monitors and the human eye. The characteristic curve describes primate contrast perception very well. For example, when primate cones in vivo (in an intact retina) are first adapted to different levels of background luminance and then exposed to contrast flashes of increased or decreased luminance, the receptor potential (cell electric discharge) describes a series of characteristic curves, as shown below. This graph clarifies a number of perceptual changes across mesopic vision. First, the total response range remains roughly constant, from about zero to 700. Second, the cones at any fixed adaptation level respond to a contrast ratio of about 3 log units, or 1000:1 trolands, which is fundamentally the limit imposed by photopigment bleaching (or, in photography, silver crystal or dye depletion). Third, the response curve shifts to higher or lower luminance levels, across a range of 7 log units, due to the effect of the adaption intensity  a large visual area of constant luminance. Fourth, the position of the adaptation response to this constant background shifts, as luminance increases, from the toe to about the middle of the characteristic curve. Finally, the gamma or contrast of these curves remains approximately constant across luminance levels, although the area of peak contrast (relative to white or middle gray) seems to darken as luminance increases, because the adaptation response shifts toward the toe of the characteristic curve. The position of the adaptation intensity in the middle of the visual characteristic curve may seem incorrect if compared to the normal placement of "white" within a photographic characteristic curve. But if we take a semilog (log/linear) plot of luminance on lightness, it is obvious that surface luminances lie in the lower half of the actual visual response range, and that the effective response is larger than 3 log units of luminance (diagram, right). Although lightness does not describe self luminous colors, the upper bound of the full characteristic curve would plausibly come at about L* = 200, which is proportionately about 1000 times the luminance of the adaptation white. Human vision seems to perform optimally (and lightness discrimination is typically measured) at luminances no greater than 320 cd/m2 or 1000 lux (equivalent to late afternoon daylight), which implies a maximum luminance sensitivity of about 3.2 to 320,000 cd/m2. 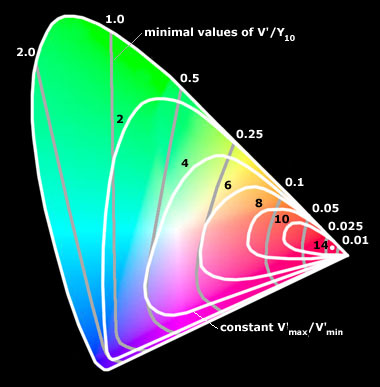 Note that the upper limit is a hazardous level of luminance exposure for human eyes. Full moonlight is illustrative, as we can see brightness contrasts both on the light source (the "man in the moon") and on the illuminated surfaces (the ground). The full moon's typical luminance is about 3000 cd/m2; its illuminance is therefore about 0.2 lux, so surface luminances range from about 0.06 (white) to 0.012 (medium gray) cd/m2. The total luminance range is therefore 3000 to 0.01 or 300,000:1, which is equivalent to about an 18 stop range in photography and is about 30 times greater than the contrast ratio produced by photopigment with pupil contraction (~4 log units). These two examples document that the human visual response covers 5 to 6 log units of luminance with a 95% contrast ratio of 10,000:1 and a gamma of about 2.4. To achieve this response range, photopigment depletion and pupil area must be dynamically amplified by other adaptation mechanisms (such as cellular adaptation and response compression, described below) in the moment to moment luminance changes of visual experience. As a result, the dynamic range of human vision is strongly clipped by conventional imaging media. This is the motivation behind high dynamic range images (HDRI), which merge the contrast information in three or more photographs taken at different f stops, or are generated whole cloth in computer animation or simulation. The fused images can capture a 105 luminance range (or more) and, displayed on high dynamic media, reproduce the impression of light, space and luminance contrast experienced in normal vision. Unfortunately HDR images appear somewhat distorted in low contrast media such as photographic prints or computer monitors (image, right), but HDR enhancements have been effectively used in cinema, which has an 80:1 contrast ratio, and in digital animation and computer game effects. A final issue is flare, defined as any contrast reducing light (brightness) added to an optical image. In all imaging systems, flare reduces both chromatic and brightness/lightness contrast, and sometimes reduces image detail as well. Flare is caused by many factors in photography, including: scattering from the diaphragm edge, lens aberration, aperture vignetted images of the light source reflected from refraction boundaries (the surfaces of lenses), light scattered inside the camera body (including light reflected from the film or sensor surface), the "spreading" or "burn out" of the brightest lights due to overexposure, overexposure of the film or fogging of the developed print, surface reflections from glossy prints or monitor screens, and the "show through" of white paper under inks. Analogous sources cause flare in animal vision. To offset flare, contrast must be increased by increasing gamma  so that the straight section of the characteristic curve has a steeper slope (blue curve in the diagram, above). This shifts the toe and knee toward the center of the luminance range, causing dark colors to shift toward black and near white colors to appear almost luminous; the range of luminance discrimination is reduced. Because surfaces are only imaged through differences in the absorptance of incident light, flare is light that obscures surface contrasts. This is almost always unwanted reflections or light that is too bright: the glare of sunlight reflected from water or snow, gloss reflectance from polished surfaces, the whitening or desaturation of surfaces viewed in bright sunlight after coming out of a darkened movie theater, the excessive depletion of cone photopigment at high illuminance levels. These produce visual flare artifacts identical to those found in imaging systems. Adaptation Mechanisms. Environmental luminance varies over an enormous range, approximately from 1 to 10 billion, so the image luminance will change over an equal range. The first nonlinear response to luminance variations begins in the photopigment reaction to light. Photopigment bleaching follows a nonlinear equation that produces a "hockey stick" curve in a log luminance/log response plot (diagram, top right). This curve provides a suitable characteristic curve (adequate image contrast) for luminances between 103 to 106 cd/m2, which is only 3 log units out of the total luminance range of 10 log units. So additional adaptation mechanisms are necessary. The first is the addition of second photopigment that has a slightly different response range but which is adjusted, through response compression rather than photopigment saturation, to have a much lower effective response range (diagram, bottom right). In mammalian eyes, this is provided by the rod photoreceptors used for night vision, which anchor the scotopic sensitivity range from about 104 to 101 cd/m2. The second strategy is aperture regulation, or adjusting the quantity of light striking the photopigment. In human eyes this is the pupillary reflex, which can expand the aperture area of the pupil by about 10 times or 1 log unit. In photography, these two strategies are represented by changes in film speed and the adjustable diaphragm. As the diagram shows, these two mechanisms would provide at most an increase of visual response to 7 log units, which leaves 3 log units of adaptation unexplained in the middle or mesopic luminance levels between 101 to 102 cd/m2. The remaining adaptation is believed to come from two processes. Response compression causes an equal increment in luminance to result in a smaller proportional change in response as the total response level increases. It is the primary adaptation mechanism in the rods, because only 10% of the rod pigment is bleached at 1000 trolands. Cellular adaptation is a shift of the entire response curve under more intense stimuli, primarily by raising the adaptation response rate. This mechanism operates in the cones and retinal ganglion cells, but apparently does not occur in the rods; rods are "pegged out" by response compression at around the mesopic threshold, and only begin to desaturate in the mesopic range. How these four separate mechanisms  photopigment depletion, pupil contraction, cellular adaptation and response compression  coordinate luminance adaptation is not yet known. However, Peter Kaiser and Robert Boynton provide a quantitative illustration of how the four principal processes might interact, as shown below. I've displayed these adaptation processes as if they were independent, variable density filters that may transmit from 100% to 0% of the imaged luminance. The net signal reduction is the filter product or cumulative effect of all adaptation mechanisms. These have more or less "pegged out" at a retinal illuminance of about 500,000 trolands, so a frosted (diffusing) 60W incandescent light bulb (which yields about 105 cd/m2) is a "safe" and commonplace stimulus to illustrate the upper limit of luminance sensitivity. Two things happen as the adaptation luminance increases. The first is a radical reduction in the scale of the luminance variance. If scotopic luminance (at about 0.01 cd/m2 or 0.28 trolands) is the point where no photopic adaptation mechanisms are operating, then adaptation reduces the luminance signal at extreme photopic levels (around 1 million cd/m2 or 3.5 million trolands) to only 0.00016% (1/633,000) of its scotopic efficacy. As an illustration, this signal reduction is equivalent to the difference in the sound of an automobile horn as heard at a distance of 10 meters or 8000 meters (5 miles). Second, the adaptation mechanisms somewhat undercompensate as luminance increases, so that a criterion perceptual effect (such as a just noticeable difference from the adaptation luminance) requires a proportionately smaller luminance difference at higher luminances. This causes the Weber fraction of incremental luminance response goes down as luminance increases, from about 25% at .01 cd/m2 to about 1.3% at 100 cd/m2. In other words, contrast increases about 100 fold from scotopic to low mesopic vision; thereafter, it remains relatively constant through the upper mesopic and photopic range. This is apparent in the divergence between a proportionally constant threshold response and the adapted signal (diagram, right). It also appears in the migration of the adaptation stimulus from the toe to the slope of the characteristic curve, as shown in the diagram above. Pigment bleaching provides the outer limit of the curve, evident in the parallel curves for photopigment (purple) and adapted signal (black). Bleaching occurs because the retinal photopigment molecules are decomposed by light, and until photopigment is regnerated light cannot affect the photoreceptor response. At luminance levels below 100 cd/m2, the process of replenishing photopigment can keep ahead of bleaching, so the pigment is "transparent" to light. At luminances above this point, bleaching occurs at a faster rate. The proportion of unbleached photopigment under stable adaptation is about 50% at 5,000 cd/m2 and less than 0.2% at 1 million cd/m2. The most gradual reduction occurs through contraction of the iris and reduction in the area of the pupil aperture. This is a reflex reaction and quite prompt; failure of the pupillary reflex is a sign of severe brain trauma or death. Starting at a full scotopic dilation of about 28 mm2, it reduces light by about 50% at a luminance of about 50 cd/m2, and reaches its maximum effect, a reduction of 87%, at luminances above 10,000 cd/m2. How does the visual system determine the appropriate adaptation level, especially for pupil contraction and cellular adaptation? It appears that rods and/or S cones in the periphery of the visual field (along the sides of the eye) play an important role, and that there are secondary cells in the retina that are photosensitive (respond to light) but do not contribute in any way to the optical image transmitted from the cones. Two additional adaptation processes are common but rarely described in conjunction with the physiological mechanisms. The first is the many forms of behavioral adaptation  turning lights on or off, moving toward or away from a light source, averting the eyes from glare or bright reflection, shielding the eyes with a hand or sunglasses. These tactics are used primarily to reduce flare and minimize changes in adaptation, or to create a task comfortable illuminance. The second is lightness anchoring, the perceptual interpretation of high and low luminance areas as white or black surfaces, which is a "local adaptation" determined by the relative proportion of high and low luminance areas in the image, separate from the "global adaptation" to the average luminance of the whole visual field. By shifting the relatively lightest areas toward white, lightness anchoring adjusts the image luminance range within the highest contrast part of the characteristic curve. Lightness anchoring can produce instantaneous color shifts, which implies a cognitive rather than sensory adaptation process. The changes in visual contrast are summarized in the schematic below. Light & Dark Adaptation. Although photopigment depletion, pupil area, cellular adaptation and/or response compression are the major mechanisms of luminance adaptation, they function together differently when adaptation shifts toward a higher or lower illuminance environment. These shifts are described as light adaptation and dark adaptation respectively. Light Adaptation. Light adaptation decreases the sensitivity of the eye to light sources or light environments that have a higher luminance than the previous (adaptation) level. These are, for example, the processes that act as we step out of a darkened movie theater, dimming the superabundant daylight to a more comfortable level. The principal feature of light adaptation is that it occurs relatively quickly in a sequence of reactions: first behavioral avoidance of extremely bright lights or glare, accompanied by pupil contraction within 2 seconds; then depletion of photopigment to a new steady proportion of maximum; and finally cellular adaptation to the higher response level. The time course depends on the starting point and size of the luminance change, but light adaptation is typically well advanced within one minute, and stabilized within 10 minutes. Light adaptation is accompanied by a temporary loss in contrast sensitivity at higher luminance levels, as these are shifted into the flattened "knee" of the characteristic curve. There is a complementary increase in the discrimination of very dark surfaces, provided they can be viewed without flare. At high luminances photopigment depletion becomes the major component of photopic light adaptation. 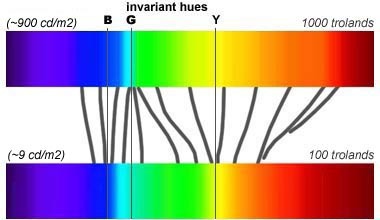 The other adaptation mechanisms do not completely saturate, so cone photoreceptor variance can still be transmitted; meanwhile the remaining photopigment is never completely depleted, and is regenerated at an exponentially higher rate as it approaches saturation. For this reason we do not become completely insensitive to light, even beyond eye damaging light levels. As they are fundamentally the same type of molecule, both the rod and cone photopigments bleach at about the same luminance levels; both have a half saturation point at about 20,000 trolands. Why then don't the rods contribute to photopic vision? The answer is that the response compression in rod photoreceptor signals, which is probably due to the different anatomy of the rod cell, effectively saturates at around 1000 trolands, or 6 log units above the luminance threshold. Above this point, any change in the photopigment produces no visual signal. Yet at this luminance only about 2% of the rod photopigment has been depleted. One consequence of cone bleaching is self screening, or a decrease in the optical density (absorptance) of the visual pigment in the eye because it has been converted into the more transparent bleaching products. A second effect is a spreading of the cone sensitivity curve under very high light intensities, which raises the relative response contribution from the tails of the cone sensitivity curve in relation to the peak. This causes a decrease in the kurtosis (peakiness) of the sensitivity curve, which decreases the separation or difference among the L, M and S signals and therefore decreases the perceived saturation of colors. The third and most intricate effect is a shift in the r/g balance  it might be called the Wright-Brindley effect after the researchers who first noticed it. This shift, which occurs in both foveal and wide field vision, changes the wavelength that is exactly complementary to a "blue violet" primary (that is, it changes the hue that mixes with the S cone signal to produce a pure "white" or achromatic color mixture). Günter Wyszecki demonstrated the effect with a standard Maxwell matching task (diagram, right top). First, three "red" (R), "green" (G) and "blue violet" (B) primary lights were mixed as a criterion light that matches illuminant D65, which has the property of remaining perfectly achromatic ("white") across all upper mesopic and photopic luminance levels. Thus, the R, G and B luminances could be increased proportionately to create a retinal illuminance range from 1,000 to 100,000 trolands, and the mixture would remain "white" at every brightness. At each luminance level, the observer matches this criterion "white" by a second mixture, consisting of a target light (T, of any "red" to "green" wavelength) with the two primary lights (the B light with either the R or G light) sufficient to desaturate it to a matching white. The chart (right, bottom) shows the example of a single "yellow" (572 nm) target light, desaturated with the B and G primaries across all luminance levels. At a retinal illuminance of 1,000 trolands (about 100 cd/m2, or the luminance of a sheet of white paper under a reading light), a "yellow" target light at 570 nm by itself makes a pure achromatic mixture with the B (445 nm) primary light: any added R or G light will tint the "white" color. But the 572 nm target light is very slightly too "red", and therefore must be shifted toward green by a small amount of the G primary. At a retinal illuminance of 100,000 trolands (about 25,000 cd/m2, or the luminance of a sheet of white paper under noon sunlight), the complement of B has shifted toward "yellow green" at 555 nm and the "yellow" 572 nm wavelength T has a "red" effect in the "white" mixture that must be counterbalanced by decreasing its luminance and by increasing the luminance of the G primary. Most of this shift occurs roughly between 5,000 and 25,000 trolands. The most interesting detail in this graph is the constant proportional luminance contribution (roughly 1/6 the total "white" luminance) of the B primary light to the target "white" mixture. This reflects both the negligible contribution of the S cone signal to the perception of brightness and also indicates that the major visual adjustments to variations in the luminance of a light occur in the relative contribution of the L and M cones to the r/b opponent contrast. The paired charts (above) allow us to see this shift in the r/g balance as the relative proportion of R or G light (red/green curve) necessary to desaturate a target wavelength between 525 to 630 nm (cyan curve). Two wavelengths, 550 nm and 572 nm, are isolated with dotted lines to make the shifts in the light mixtures easier to compare. The point where neither light is required (the R/G curve is at zero) defines the wavelength of the mixing complement of the 445 nm B light  570 nm at 1,000 trolands and 555 nm at 100,000 trolands. The approximate shape of the R/G curve remains roughly the same (steep on the R side and more sloping on the G side), which implies that the shifts therefore occur in the proportional L and M cone contribution to the opponent contrast: the L cones contribute relatively more to the chromatic signal at higher luminances. The higher L tinting strength implies a slight "magenta" (R+B) bias in the target mixture at high luminances, which requires a greater luminance in target "blue green" lights, and reduced R luminance, to compensate. Finally, there are negligible shifts in "blue" or "violet" target wavelengths (below ~492 nm) because both the criterion and matching mixtures contain the same quantity of R and G primaries. These complex adjustments clearly identify a failure in the proportionality requirement of Grassmann's Laws. The shifts implicate the r/g but not the y/b opponent balance in the proportionality failures. These changes in the r/g "yellow balance" are measurable in lights, but not in surface colors: in that respect they resemble the color shifts of the Bezold-Brücke effect. However, the shift in the B complementary wavelength is very large, so it contributes to global changes in color appearance (via perceptions of the illuminant)  for example, the fact that "cool" (illuminant D65) light sources appear more pleasing than "warm" (illuminant A) light sources at higher illuminance levels. Dark Adaptation. Dark adaptation increases the sensitivity of the eye to light sources or light environments that have a lower luminance than the previous (adaptation) level. These are, for example, the processes that engage after we step from summer sunlight into a darkened movie theater. The principal features of dark adaptation are that it occurs relatively slowly and in two distinct stages. There is a prompt increase in photopic (cone) sensitivity, corresponding to a sharp drop in the faintest perceptible luminance, which is completed within about 5 minutes; then a more gradual increase in scotopic (rod) sensitivity, corresponding to a gradual perception of luminances as low as 106 cd/m2 (about 1/36,000 of a troland), which is completed within about 30 to 40 minutes (diagram, right). These changes are accompanied by behavioral adaptations  restricted or cautious movement, and reliance on touch or sound  for the first few minutes. As these curves imply, complete photopigment regeneration occurs over 3 times more rapidly in cones than in rods. However, the initial prompt increase in dark sensitivity is assisted by increased pupil dilation and a shift in cone cellular adaptation, processes that do not affect the rod sensitivity. Dark adaptation imposes a relatively prolonged loss in contrast sensitivity at low luminance levels, as these are shifted deep into the flattened "toe" of the characteristic curve and, for very dark surfaces, below the adaptation threshold. There is a complementary increase in the discrimination of very light valued or bright surfaces and reflections, for example in the surreal and romantic clarity of moonlit clouds and water reflections as one leaves the mountain lodge for a midnight stroll. Rod/Cone Interactions. The source of mesopic color shifts lies in the transition from cone based color vision to rod based color vision. During this shift cones and rods dynamically collaborate in color perception. From the prejudice of colorimetry, this was considered a disruption or complication of trichromatic color matches; thus it was traditionally called rod intrusion. Mesopic color changes are now studied as rod/cone interactions. There are four major differences in color appearance between rod and cone vision. The first is in rod chromaticity. Rod sensitivity is usually equated with the "blue green" peak in the scotopic luminosity function at around 505 nm, but if the curve is interpreted as a color matching function or a transmission profile applied to an equal energy "white" illuminant, its chromaticity actually corresponds to a CIECAM or CIELAB hue angle of about 210, or a spectral hue of 480 nm, which is a cerulean or turquoise blue. The brightening of green or blue green surface colors (the more common description of the Purkinje shift) corresponds instead to the union of the photopic and scotopic sensitivity curves (the wavelengths that stimulate both functions), which has a CIECAM hue angle of 154 matching a middle green wavelength of 520 nm. The second difference is in rod lightness contrast, which is qualitatively darker and softer. I cannot find in my references a scotopic lightness function (a curve equating a scotopic luminance factor with perceived lightness or whiteness), however the sensation of scotopic white equates to a photopic gray of about 75% reflectance (diagram right), and the foveal contrast function seems to have a much lower gamma (a Weber fraction above 20%) with contrast shifted into the highest reflectances, as illustrated above. The last differences between rod and cone vision are a change in the quality of white, which in scotopic vision has a ghostly, silky sheen; a reduction in spatial resolution (especially in foveal vision), which softens edges and internal details; and significant reduction in parafoveal depth perception of objects viewed in isolation. The shift to scotopic vision produces a visual field tinted a pale, gray greenish blue, in which lighter valued forms are characterized by outline, and darker forms lose almost all internal (low contrast) detail; very small forms cannot be discriminated, and rapid movements are greatly blurred. As light dims into the middle and lower mesopic range, the cone responses do not "fade out" equally. There is instead a shift in chromatic sensitivity toward the extreme "red" wavelengths. This is measured using color mixtures contrived to display differences between photopic and scotopic brightness, while retaining a constant chromaticity during the mesopic transition. This allows differences in light sensitivity between scotopic and photopic vision to be mapped into a standard chromaticity diagram, as shown below. 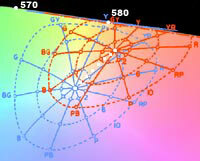 The isobars in the diagram show that the extreme values concentrate in the "red" corner of the chromaticity space, and contract more quickly from the "green" than from the "violet" corner, especially at moderate mesopic levels. Thus, at near scotopic light levels, the cone sensitivity to "red" light is roughly 14 times higher than the rod sensitivity to the same chromaticity. This is why astronomers and submariners use red lights to perform photopic tasks (such as reading) without disrupting their dark adaptation. Tetrachromatic Color Matching. Given the fact of rod intrusion, mesopic vision is actually tetrachromatic: its color mixtures are the result of four "primary" inputs  L, M, S and V'. To assess the mixture characteristics of this four color or tetrachromatic color space, Pat Trezona provided her viewers with four adjustable "primary" lights at wavelengths 470 nm ("blue", B), 510 nm ("green", C), 590 nm ("orange", Y) and 645 nm ("red", R) that were used in the maximum saturation color matching method to match a range of monochromatic target lights (Q). One or more of the "primary" lights could be mixed with the target light, to desaturate it. Viewers first mixed the R, Y and B "primary" lights to match the target light (with one or two "primary" lights mixed with it) at mid mesopic luminances (400 trolands). Then the mixtures were reduced to scotopic luminance (< 2 trolands), the viewer was allowed to dark adapt, and the C "primary" light was added to the dimmer mixture to restore a scotopic (brightness) match. Then the lights were returned to photopic levels and the match was adjusted again. This alternation was repeated up to three times until mixtures were obtained that did not change color or brightness between mesopic and scoptopic levels. The results for all target lights were four "primary" matching functions with 1, 2, 3 or 4 inflections or peaks across the spectrum (diagram, right). Negative values indicate the "primary" light was mixed with the target color. Two mixtures, for "blue violet" and "green", are shown in the diagram to illustrate that Trezona's color matching method essentially defines two near neutral or achromatic mixtures of matching brightness. The "blue violet" criterion is desaturated by the "yellow" mixture R+C, which then is matched by the similar achromatic mixture Y+B. Similarly, the "green" criterion is desaturated by the dull "blue red" (R with a tint of B), which matches the feeble "green" mixture Y+C. The exceptional mixtures are in the long wavelengths, where only the R primary has a nonzero value because the long wavelength criterion lights appeared "red" (rather than achromatic) even at scotopic luminance levels. The unexpected effect was that these brightness/chromaticity matches remained metameric (visually identical) across all intermediate levels of scotopic or mesopic luminance. In other words, the mixtures define brightness confusion lines in spectral mixtures that are unaffected by changes in luminance adaptation. Note that these curves are not color matching functions (because chromaticity was in most cases very low) but adaptation balancing functions. The functional implications are easier to understand when they are transformed into a trichromatic color space (the "primary" matching curves can have no more than three inflections), as shown below. Two of the curves seem familiar. One is a blue violet (B) function, matching the shape and peak of the S cone sensitivity curve (tristimulus Z), that represents the contribution of the S cones. The V function, which resembles the shape and peak of the photopic luminosity function (tristimulus Y) with the S cone contribution removed (the negative values in the "violet" wavelengths). This curve defines an intense "yellow green" chromaticity which probably compensates for mid spectrum brightness differences in the luminous efficiency (brightness) of mesopic and scotopic lights. The two largest curves are exact visual complements and they account for nearly all of the adaptation balancing (see inset). One is a supersaturated, luminance destroying magenta (M) and the second is its almost mirror image  a supersaturated, luminous middle green (G). >>(that resembles the r/g opponent function,) I conjecture that Trezona recovered a luminance dependent shift in a mesopic green/magenta balance that is analogous to the luminance dependent shift in the photopic yellow balance. Consider that the chromatic adaptation problem of neutralizing the balance in a Maxwell matching task is the same as the problem of neutralizing any chromatic bias in color perception: are simply dealing with "white" in one case and "color" in another. The problem is to identify the natural light problem that Trezona's adaptation balance is evolved to solve. If we look at the trace in CIECAM of optimal colors of type B, we find that they form two opposing lobes in the color space. 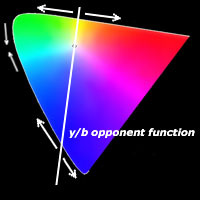 Shifts in the yellow balance are believed to be caused by bleaching differences in the L and M photopigments that define the r/g opponent function. The green/magenta balance would be caused by rod signals that are transmitted through cone pathways and are interpreted as M and/or S cone signals. Under photopic and high mesopic vision, luminance sensitivity is defined by the L+M signal in a weighting of about 1.5 L to 1 M. However, under mesopic illuminance the rods begin to stimulate the cone pathways in ways that resemble "green" light, which inflates the M component of the cone luminance and chromatic signals. At the same time, the rods stimulate the S cone pathways to produce a phantom violet sensation, which combines with the persistent L cone chromatic signal. These define the contrasting "green" and "magenta" components in mesopic color. Whatever the actual mechanisms of mesopic adaptation may be, the green/magenta balance can be vividly experienced in the negative afterimage of a "white" light. In a dark room, first expose both eyes to the view of a 60W light bulb for one minute. Then turn off the light and look into a completely dark corner of the room. The positive afterimage of the bulb first appears as a bright yellow green enclosing a dark violet core. After a few moments this changes to a negative afterimage  magenta with a yellow green or yellow penumbra. The magenta and green oscillate slowly, until the image shifts into into a saturated violet surrounded by bluish green. The intense light exposure bleaches the rods and cones, and the oscillations in darkness display all the colors identified in Trezona's matching method. They appear to be different contrast mechanisms seeking an objective balance point, as the oscillations are suppressed by the image of exterior objects. Painters and graphic artists will want to read the article Night Rendering by Henrik Jensen et al. (2000). The previous section explored adaptation related changes in color appearance that are produced by changes in the photoreceptors and the early visual pathways. This adaptation creates a new problem: how to consistently recognize white or black in surface colors across a varying range of luminance values. Because of luminance adaptation, the absolute luminance of any isolated surface provides a very poor cue of its reflectance properties. The diagram below illustrates the remarkable range of luminances that masquerade under the seemingly consistent appearance of white and black contrast. Under noon sunlight illuminance, the black shirt has the same luminance (about 2600 candelas per square meter) as white paper in daylight shade. In the shade, the black shirt reflects more light than the white paper under a reading light (about 84 cd/m2); and the black shirt under the reading light reflects over 100 times more light than the white paper under full moonlight. Yet these transformations do not affect our recognition of the gray scale. Lightness Induction. The visual system has approximately a 10,000:1 contrast ratio within 95% of its response range that can shift to enclose almost any naturally occuring luminance levels. Surface reflectance produces about a 150:1 luminance ratio, which is compressed into roughly a 20:1 lightness ratio. However shadows darken surfaces by as much as 60%, producing a 300:1 luminance ratio and the tinting layer necessary to define textures, shapes and objects. The illuminance from noon to midnight varies by a billion to one or more. But because of the absorptance properties of physical surfaces, object luminance from diffusely reflecting surfaces varies by a factor of no more than 33:1 and in many settings by less than 20:1. Hence grays stand for the surfaces that predominate in the visual image but lie within a narrow luminance range. Vision adapts to this luminance level. This luminance span, defined almost entirely by outputs from the L and M cones, is structured as a brightness/blackness (b/k) opponent dimension, ordered on increasing luminance (diagram, below). On this dimension, white is the neutral or adaptation point, the perceptual quality that has both minimal brightness (self luminous quality) and minimal blackness (absorptance quality). Nearly all our visual experience is shaped by the lightness of surfaces, clouds and sky  that is, in the blackness half of the opponent contrast. This is why white and black, unlike the chromatic unique hues of opponent theory, can mix with each other: white is the neutral ("gray") luminance color, so it mixes with brightness and blackness in the same way that gray mixes with the opponent hues yellow and blue, or red and green. And, in the same way that a gray area takes on the complementary hue of a surrounding chromatic field, a small white area can appear to glow if surrounded by a large field, or appear grayed if surrounded by a large bright field. Paradoxically, this means our luminance experience of the world is radically "monochromatic"  weighted toward the lightness side of the b/k opponent dimension. It is as if all surface colors were experienced as various shades of red, and only lights or bright reflections appeared green. These blackness colors are produced by a negative luminance contrast between a color area and its surrounding or background areas. The diagram (right) illustrates what happens when viewers examine a circular target light projected within a background that is either completely dark or moderately bright. Against the 0 cd/m2 background, the apparent brightness changes in proportion to the luminance of the target light from 100,000 cd/m2 to 1 cd/m2, and consistently with a quality of shining or brightness. No matter how dim it becomes, the light appears self luminous. However, when the target is viewed against the 300 cd/m2 background, it acquires the quality of blackness when its luminance is less than the background luminance. It loses its self luminous quality and turns gray, finally becoming black. This change from the quality of self luminous brightness to surface blackness is called lightness induction. The third aspect of lightness induction is that it anchors on the lightest values in the visual field. These are perceived as "white" or "bright" depending on their visual size and luminance contrast with the background. This is dramatically demonstrated with the Gelb staircase effect, as simulated below. The fact that a surface of very low reflectance (black) appears to be a middle gray occurs because the Gelb staircase reflectance samples occupy only a small part of the total visual field: the fourth aspect is that vision adapts to a spatial luminance distribution, in which relative luminance ratios are reconciled with their relative visual area, as explained below. The fifth aspect of lightness induction is that it is strongly affected by the spatial structure of the visual field  where "spatial structure" is somewhat confusingly used to indicate both the two dimensional pattern of color areas in the visual image and the three dimensional arrangement of objects in relation to light sources. A variety of two dimensional demonstrations of this are possible, but the example below is easy to construct. The stimulus display consists of a white square and a black square, of equal size and at right angles. Extending from each square, in the same plane, is a small tab of the opposite color. The display is illuminated so that the horizontal square and tab receive 30 times the illumination of the vertical square and tab; the black paint has only 1/30th the luminance of the white paint, so the tabs have equal luminance. When a naive viewer examines the array monocularly (through a peephole), the tabs seem to be painted onto the large squares behind them, and contrast is defined by them. 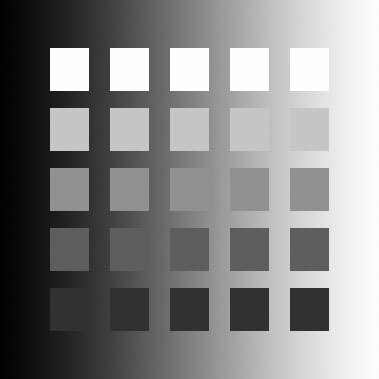 But viewed binocularly, the tabs appear connected to the opposing planes, and this single spatial change is enough to literally reverse the perception of both tab colors, from a dark gray (around L = 35) to a near white (L = 80). effect of luminance adaptation: anchoring effect stronger in weaker light. The spatial pattern of lights and darks is so important to lightness induction that it appears even at the binocular fusion between the two eyes. The strength of this rivalry can be experienced in the following diagram, after the two images are "free fused" or overlapped through a visual contortion. The matching circles on the left and right differ by the same lightness difference (ΔL = 20), but are in the opposite direction for the central circles. As a result these do not fuse to form an average lightness percept  instead they seem to hover and slip, one over the other. This effect is present in iridescent or fringe colors, which the two eyes view at slightly different angles and therefore see as two overlapping colors. It illustrates that spatial consistency is fundamental to our luminance perception. White Anchoring and Light Area. 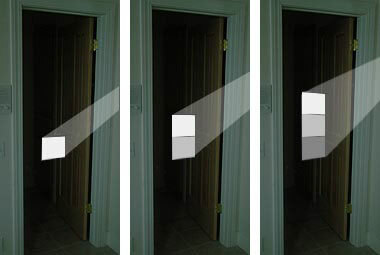 The contrast study (described above) showed that the apparent brightness of a light viewed in a dark surround is proportional to some power of its luminance. This power is defined by the Weber fraction or the luminance increase necessary to produce a just noticeable difference in brightness. For illustration this proportional brightness weight (WB) (ω). Under lightness induction, a disproportional blackness weight (WK) is added to all related colors whose luminances are lower than the white standard, causing them to darken into grays (diagram, right top). This perceptual shift has the paradoxical effect of making surface luminances appear lighter valued than their equivalent brightness, while adding the perceptual quality of blackness that makes them appear as shades of gray. If we imagine an ideal surface that by reflectance creates an equal visual area for every luminance value, and distributes these values randomly as pixels below the fusion threshold, then the brightness weight alone would anchor the average luminance at Y = 31 and the perceived lightness at L = 61. The blackness weight increases the luminance further, to Y = 51, corresponding to a lightness of L = 75. Thus a surface that reflected any random, flat distribution of luminances would appear on average as light valued. Intriguingly, the average brightness weight corresponds to the luminance of a perfectly diffusing white surface expressed as a ratio (0.314) of the incident illuminance; and the average blackness weight (0.51) corresponds to a 50% reflectance. In effect, the "deficit" of natural surfaces is counterbalanced by the blackness weight (diagram, right) so that actual surfaces are shifted closer to their ideal values. They are made to appear brighter than they actually are. In addition, shadows cast by full sunlight represent the illuminance of a clear sky (12,000 lux), which is as little as 10% of the illuminance from the sun (~60,000 to 120,000 lux). This 1:10 ratio means that the lightness of a white surface in cast shadow has the same lightness as a dark gray in sunlight. This is the average shift: no shift occurs for white colors, and a tenfold shift occurs in very dark colors. The apparent luminance of near white surfaces corresponds to a perfectly diffused illuminance, while the average gray also increases the strength of lightness contrast or compensatory overweighting of darker grays, and a curbing of the lightness function that causes and increasing contrast with black. This increases the perceived darkening of surfaces and the contrast among reflectance values. The final step is to cognitively shift the perceptual lightness scale until the brightest luminance value has the property of white. Color vision assumes that the lightest valued color areas have minimal absorptance, but also minimal brightness. As a result, white is the adaptation neutral value of lightness judgments. It produces luminance perception without any upward pressure on the luminance adaptation (which would darken all colors). The highest luminance rule, proposed by Wallach, is that the highest luminance value perceived as a surface is linked to the color concept white. Then grays are assigned by the ratio rule. These rules were explored in an elegant series of experiments by Alan Gilchrist and colleagues, who asked viewers to look at a whole field (180°) achromatic pattern of a medium and dark gray, presented on the interior of a 30" (76 cm) hemisphere illuminated from below, by diffuse lighting (medium gray luminance of 11 cd/m2). Viewers then assigned lightness values to the two grays, from memory, using a Munsell value scale viewed in a separate room under brighter lighting (medium gray luminance of 135 cd/m2). The diagram below shows the hemisphere area as a circle, the experimental patterns, and the contrast between the average perceived gray values.  other gray values are perceptually related to a gray scale in approximately their luminance ratio to the white anchor. The researchers proposed a relative area rule to account for the variations in lightness contrast once the white anchor had been established, as shown below. If the darker area represents less than 50% of the visual field, then vision simply reports the luminance ratio. As the dark area becomes larger, the white field is pushed to appear more luminous, and the dark area becomes lighter behind it. This only applies when the second color appears as a decrement or darker value than white. If it is an increment, then the higher value appears self luminous. Self luminance appears when the brightest area is very small and appears against a very large, dark background. However, it appears that the amount of contrast with white is also affected by the global spatial pattern of figure/ground (diagram, right). Thus, the peripheral edge produces greater contrast reduction than the light dot, even though the dark area is larger behind the light dot; the complementary elliptical fields produce the same contrast, even though the ellipse is one third smaller than the peripheral ring. The highest contrast  the darkest dark and the lightest white  is produced by a central dark dot (1.4° wide) and by a visual field split by a single edge; these produce the largest lightness contrast, with the dark dot or dark edge below middle gray. The smallest contrast is produced by a peripheral edge, such as the horizon when we look up at the sky, which also produces the lightest visual field. Below this is a light dot, which produces the twilight sensation of a luminous disc within a glowing sky. A large elliptical field (91° by 118°) centered within a peripheral ring produces the same contrast regardless of which field is light or dark, and this contrast matches the stimulus contrast  from white to a gray above middle gray. lightness percepts that remain constant across changes in total illumination are illumination invariant, and lightness percepts that remain constant across changes in luminance ratios with adjacent or background areas are background invariant. backgrounds must be integrated across large retinal angles. these must appear to "belong together," for example to lie in the same spatial plane. reflectance edges indicate changes in surface absorbance; illumination edges define shadows. this determines how areas in the image belong. We are familiar with the experience of going from daylight into a darkened room or theater, and then returning into bright sunlight again: our eyes require a few moments to adapt to the light changes. I discuss these effects of visual adaptation in the page on color in the world, but it seems appropriate to conclude this discussion of color contrasts with a look at luminosity contrastsas well. Two Kinds of Luminance Change. The luminance related effects appear as changes in the "volume" and "shape" of the color space: lightness contrast and chromatic contrast increase, and there is a shift in hues. The example shows a simple contrast pattern under moderate to low illuminance from a single source. If illumination is selectively increased on only part of the pattern, the lightness of that part appears to increase, as does the contrast with the background. A similar increase in contrast occurs by increasing the illumination across the entire pattern. Method B amounts to a visual illusion and is commonly used in art galleries to increase the apparent contrast and colorfulness of works of art. Mesopic Color Appearance. These apply to differences in color appearance between sunrise or sunset and midday sunlight. Stevens Effect. As light becomes more intense, the perception of lightness contrast increases. This contrast increases visual acuity, especially of fine detail, within the normal range of daylight illumination. The Stevens effect is the perceptual basis for our linguistic association of light and intellect: we shed light on a problem, see the light, are "bright" (intelligent), and symbolize an aha! or creative insight with a light bulb. The example at right shows the general effect of increased brightness on lightness contrast. Example a shows the case where a target color is much lighter than the surround. In this case, as the illumination is increased in brightness, the relative contrast between the two areas increases, with the surround appearing to become darker and the target color appearing to become lighter. Example b shows the case where the target color and surround are similar in value; as brightness is increased this relationship is maintained. Example c shows the case where the target color is much darker than the surround; again, as the illumination is increased, the contrast between the two areas increases, with the target area appearing blacker. Hunt Effect. As light becomes more intense, the perception of colorfulness or chroma also increases. This is called the Hunt Effect, after the vision scientist who measured and described it in 1952 by asking participants to match the chroma of two colors presented separately and at different luminance levels to the two eyes. It applies both to lights and to surfaces. The Stevens and Hunt effects are both changes in the gamma or contrast function of the characteristic curve. The size of the effect is not large: using an indoor daylight illuminance of about 1000 lux as the benchmark, contrast decreases by about 7% at an illuminance of 20 lux and increases by about 7% at an illuminance of about 10,000 lux. However, it is easy to observe the Hunt effect. First find a large, brightly colored image in a magazine or book, but do not look at it closely once you have chosen it. Instead, go outdoors on a bright day, wait a few minutes for your eyes to adapt to the light, then leisurely study the image and the color contrasts it contains. Then go indoors to a windowless room illuminated by an incandescent (tungsten) light, let your eyes adapt for five minutes, and study the image again. Bezold-Brücke Effect. As light becomes more intense, the perception of wavelength hues also changes. This effect is called the Bezold-Brücke Effect after the two 19th century scientists who described it. The main effect is a significant expansion of the wavelengths that appear yellow or blue, with a corresponding decrease in the wavelengths that appear green or red, as retinal illuminance increases from 100 to 1000 trolands. This is roughly equivalent to stimulus luminances of 8 and 130 cd/m2, a contrast that straddles the boundary between mesopic and photopic vision. Although rod vision may be partly involved, most of the shift is attributed to different adaptation curves for the y/b and r/g opponent processes. This produces a corresponding shift in the elevation and spread of the hue cancellation curves. The r/g dimension is apparently more sensitive to luminosity changes and adapts to a greater degree than the y/b or w/k dimensions, lowering its relative response at high light levels. It is instructive to compare this figure with the analysis of hue discrimination using the hue cancellation method with unique hue mixtures. This seems justified by the fact that the three spectral unique hues are constant across luminosity changes, and by the similar expansion of the "yellow/orange" and "blue" sections of the spectrum and the corresponding compression in the "blue violet," "green" and "red" sections in both the hue cancellation and hue shifts. The Abney applies to both surfaces and lights. Contrast can justifiably be called the fourth colormaking attribute. Both luminance and chroma are strongly influenced by local contrast, and sensitivity regulation can be thought of as a kind of contrast adaptation, in the same way as chromatic adaptation. Contrast is a fundamental reference space, centered on a dark valued (reflectance 20%) neutral gray and extending across a luminance span of roughly 100:1 in physical units, which vision continually adapts to maintain. Color constancy is, first of all, a matter of a constant contrast environment. Scotopic Color Appearance. The color literature too often implies that vision neatly divides into separate scotopic and photopic regimes. This supports the application of colorimetry by assuming that Grassmann's Laws are valid far into the mesopic range. In fact, especially for wide field (>10°) vision (the standard observer measured with full photopic "primary" mixtures), as luminance decreases through the mesopic range, luminance adaptation and threshold responses are averaged over a larger area of the retina, and trichromatic color matches breaks down due to additivity failure. As I explain below, low mesopic vision desaturates hue, shifts the white point toward blue, and constricts the perceptible differences in a reflectance gray scale toward white. The appearance of white surfaces changes from an almost luminous brightness to a veiled, shimmering gray; foveal detail disappears and the world dissolves into a quilt of large, low contrast shapes. These changes are hardly captured in the usual description of the Purkinje shift as "an increase in the brightness of blue and green colors". There recently has been increased interest in mesopic color matching and color appearance changes under low luminance adaptation, particularly the naming or identification of colors under mesopic illumination that is below the colorimetric range. I describe both my personal observations and some current research findings.  0 minutes (sunset, A) (solar altitude 0°, illuminance ~200 lux). There was a full range of color against the white background that appeared somewhat subdued, like a book under a reading light.  +15 minutes (B) (4°, ~20 lux). The white paper begins to dim and soften, appearing slightly luminous; magenta, red and orange become slightly lighter valued and more saturated, as if glowing; red violet, purple and blues darken slightly. Greens acquire the softened appearance of the whites, and a few minutes after the reds appear to brighten, yellow green and middle green appear also to brighten slightly. Yellows lose their sunny, floral character and begin to shift toward a tan or ochre.  +30 minutes (C) (8°,~2 lux). Bright yellow colors disappear and become indistinguishable from ochre, raw umber or green gold; the relative green or red content of yellow comes to the fore, causing yellows to appear either green or pinkish tan. Blues and greens begin to merge; dark purple appears jet black. The colors show a much reduced chroma, but still appear relatively saturated because lightness is also substantially reduced.  +45 minutes (12°,~0.2 lux). All colors have been reduced to three percepts  tan, grue and a warm (reddish) dark gray. The darkest blue or green colors turn to black. Brown appears very dark but warm.  +60 minutes (D) (16°, ~0.02 lux). Near the limit of color vision. The paper appears a silky grayish blue and lightness contrast is much reduced; all reds and browns collapse into a generic "warm" that is much darker than the photopic colors. All greens and blues appear as a grayish "grue" (green blue) that is lighter (greens) or darker (blues) than the photopic colors. Yellows, ochre and green gold drop to a mid value with a faint orange cast.  +90 minutes (E) (<0.001 lux). Under complete scotopic vision color is objectively lost (tested by looking at unfamiliar magazine covers), but some trace of color remains in the familiar sheet (especially for colors with a very light or dark scotopic value), probably due to memory color and/or rudimentary hue perception based on "grue" rods and "red" L cones.  the transition from photopic to scotopic vision is nonlinear  color shifts are rapid and dramatic in the range of about 5 to 0.05 lux, but are more subtle above or below that range.  chroma grows smaller, in approximately the same proportion for all hues, down to the visual limit; some hue (and therefore chroma) persists until scotopic vision, and then after  either as memory color or as the hue associated by experience with each scotopic lightness.  reliable color discrimination, including accurate identification of yellow shades, persists down to illuminances of 10 to 1 lux [yellow mesopic stage]; nearly all color disappears at illuminances below 0.003 lux [scotopic].  at around 5 lux, a bright yellow percept disappers (yellows become confused with ochres or green golds), but greens and blues remain distinct [green mesopic stage].  below 1 lux, discrimination between blues and greens fails or is determined by the color's scotopic luminosity  relative lightness as perceived by rods alone; sienna, red, orange and magenta remain recognizable [red mesopic stage].  below 0.1 lux red, orange and brown become indistinguishable, red violet and purple appear black, but a weak warm/cool contrast still functions [warm mesopic stage]. Related studies suggest that most of the hue changes in mesopic vision occur at the opponent stage rather than the trichromatic stage, and that color shifts occur separately on the y/b and r/g channels. The current research reports disagree on the transition points in mesopic color appearance by as much as 1 log unit of illuminance, which is probably due to large observer individual differences in adaptation, differences in stimulus presentation or adaptation preparation, or inaccuracies in illuminance measurement. The low mesopic sequence of discriminations between yellow and ochre/green gold, green and blue, and scarlet and brown have been sufficiently replicated to serve as adaptation benchmarks. Scotopic Color Appearance. I first examined mesopic and scotopic contrast perception by viewing a photographer's gray scale late at night, from full studio lighting to moonless night adaptation. The diagram shows that contrast is substantially reduced under scotopic adaptation, somewhat reduced at around the mesopic threshold, but is relatively constant as illuminance increases into the photopic range. The degradation in the gray discrimination and darkening of the "white" standard is consistent with the shift in adaptation luminance toward the toe of the characteristic curve as adaptation luminance decreases, which puts the maximum contrast at luminances above surface luminances. On a moonless night we perceive surface lightness differences only coarsely, but have a delicate sensitivity to brightness differences among stars. In daylight the adaptation gray and white shift into the middle of the characteristic curve, and the contrast in bright lights is much reduced compared to the contrast in surface grays. White Luminance Tokens. The lightness measurements used by Gilchrist confound two different visual judgments: (1) that an achromatic contrast appears relatively the same under two different levels of illumination; and (2) that a "white" at one level of adaptation is perceptually identical to a "white" at a different level of adaptation. The first statement is empirically true: the second statement is obviously false. The example (right) is offered as a reminder that the common experience of a white piece of paper is qualitatively different when the paper is viewed under different levels of illumination. A variety of cues seem to influence the perceived color. The is an obvious difference between light and shadow, but this difference is qualitatively unique at different illuminance levels. The perceptual issue here is similar to color constancy under a chromatic illuminant. If we examine a familiar room under a colored red or green light, we seem able to perceive the "true" colors of the objects at the same time that we can perceive that the illuminant has its own hue. In a similar way, we are able to see white as a fixed color, even though the perception "white" differs qualitatively across illumination levels. Under scotopic vision, whites appear to be a middle gray, and blacks are quite dark. Under daylight illumination, whites appear quite bright and darks are induced by contrast. The illustration (right) suggests the variations that are encountered around my home on a sunny day.  Star scotopic (below 1 troland). The value range is collapsed, with foveal blindness, and there is no color vision.  Moon scotopic (1-10 trolands). The value range is large, there is no color vision, with foveal blindness.  Twilight Mesopic (10-300 trolands). The value range is large, with expanding chromaticity and foveal acuity, but the light appears subdued.  Intimate Light (300-3000 trolands). The value range is large, with expanding chromaticity and foveal acuity, and the light appears ample.  Public Light. (3000-8000 trolands). Limit of mesopic metamers; colorfulness and luminance contrast at maximum.  Task Light. (8,000-80,000 trolands). Hue shift from green to red; colorfulness and luminance contrast align with the y/b opponent function.  Sky Light. (80,000+ trolands). Lower limit of photopic metamers; colorfulness and luminance contrast peak, as in rainbows; luminance only achieved by light sources.  Sun Light. (80,000+ trolands). Lower limit of photopic metamers; colorfulness and luminance contrast peak, as in rainbows; luminance only achieved by light sources. The fact that these qualitative changes in "white" surfaces exist means both that they are one outcome of visual processing, and that they are also one benchmark for color recognition. links between white, bright and "brightness of white"
The diagram shows a solution. A "minimal brightness" quality attaches to the standard perceived as white in any environment. The white itself has an apparent brightness which is determined by the luminance adaptation. The phenomenological range of whites is an excellent example of a very broad color change that is unmarked by language: a case where color terminology does not track color appearance. The Whiteness of Whites. A final point is that the qualitative "color of white" is itself problematic. Technically, white is a color area that appears completely to lack any chromaticity or grayness. If measured under standard conditions, the range of surface colors accepted as "white" is quite small (compared to the range of all possible colors), but it does shift with the color of the illuminant  a warm incandescent light causes yellowish surfaces to be accepted as white, while typical daylight shifts the achromatic point toward blue violet. Walls that appear to be a clay yellow during the day can appear perfectly white at night, under incandescent lights. However, in specific preference situations and under consistent illumination, the identification of a "true white" or "ideal white" varies considerably across individuals and, in many cases, varies in the same individual from one time to the next. According to Wyszecki & Stiles people differ by "a large amount", in what appears to be a combination of color vision differences, habitual exposure to white surfaces of one type or another, and personal preference.  the chromaticity or deviation from zero values on opponent dimensions (a* and b* in CIELAB), or deviation from the white point established by the illuminant and a "pure" white reference, such as magnesium oxide. Blueness is common in historically earlier formulas; most current measures use some combination of luminance and chromaticity distance from the white point. Chromatic adaptation, as defined by Wyszecki & Stiles (1982), is a change in the visual response to a color stimulus that is caused by (1) previous exposure to a conditioning stimulus (such as a luminous colored light or intensely colored surface) or (2) simultaneous presentation of the color stimulus against a surround or background of a different color. These are different visual processes. The first is described below successive color contrast. The second defines the situation discussed in the next section as chromatic induction. There is also a third process, usually introduced as part of color constancy: the visual system adapts to the illuminant (the chromaticity of the illumination) by shifting the appearance of all colors to restore the neutral appearance of a white surface. In fact, many studies of chromatic adaptation manipulate the illuminant rather than the surround color or the viewer's exposure to a conditioning field. So this seems to be a third case. Theory of Chromatic Adaptation. The mechanism has been described near the receptor end of the visual process, and has been developed in two forms: as a receptor adaptation, and as a balancing within the opponent functions. Photoreceptor Adaptation. A significant part of chromatic adaptation appears to take place in the photoreceptors, either as a change in the individual sensitivity curves of the L, M and S cones, or in the response of the retinal secondary cells to the cone outputs. That is, the adaptation occurs before the cone outputs are transformed into the opponent functions. The adjustments. The diagram below shows the type of shifts that occur as the illuminant changes from daylight D65 to incandescent A. The increase in long wavelength light bleaches proportionately more L and M photopigment, lowering the L and M cone response probabilities, while the decrease in short wavelength light allows more S photopigment to regenerate, increasing the probability of response by the S cone. When confronted by a sudden change in illuminant, the time required for this adaptation to complete can be relatively short, on the order of 5 minutes. As this is an evolved response to the gradual changes in daylight phases, we normally notice color discrepancies only in unusual circumstances, such as quick storms, overhead smoke, or fire. Fortunately, we have a system that describes visual complementary colors precisely (the opponent process algebra). And we can use it to describe and explain complementary color contrasts. Complementary Colors. Newton's hue circle implicitly requires that every spectral hue will have a single spectral opposite (or mixture of two opposite spectral hues) that can combine with it to create white light. Newton did not state this rule definitively because he could not consistently produce white mixtures with the broad spectral bands he was able to isolate with his prisms. But it was derived logically from his color circle by the German physicist Hermann Grassmann in 1853 as one of the basic color mixing principles known as Grassmann's laws, which were experimentally confirmed by Helmholtz and Maxwell in the 1850's. These paired hues are now called complementary colors. These arise naturally from the geometry of Isaac Newton's hue circle and his observation that colors opposite each other on the hue circle create a "faint anonymous" (neutral) color when mixed. They suggest that all opposing colors are created equal, in the sense that they all can be mixed to the same "color" of white light. Complementary colors are also the point where hue sensation gives way to hue relation, which means a cognitive process is now interfering with the sensation in a way that symbolizes more than a simple hue contrast, such as the difference between red and yellow. These illusory hue changes are visible as simultaneous color contrasts. They show that we do not see the world as it is, because we see color differences where the physical stimuli are the same. Only their context changes. Newton stated the definition of complementary colors that is still used today: any two hues that, mixed in the right proportions, produce a neutral (pure white, gray or black) color. How do we determine the exact complementary color for any color we choose? The simplest way is to determine a weight or quantity of the two opponent processes that determine the chosen color, then identify the color that is produced if we apply the same weights to the opposing process hues. As an example, we might start with a yellow red (scarlet), and determine that this color can be matched by a quantity c1 of the r process and a quantity c2 of the y process. In that case, the complementary color for scarlet will be the color produced by a quantity c1 of the g process (the opposite of red) and a quantity c2 of the b process (the opposite of yellow). This gives us the complementary color to scarlet: a blue green (cyan). Complements defined in terms of the opponent processes are called visual complementary colors because their "mix to gray" relationship is determined by our visual system and the mixing of lights. Thus, a monochromatic (single wavelength) light that matches our scarlet hue will produce a "white" mixture with a second monochromatic light that matches our cyan. Again, we would also have to specify the w/k opponent process if we want to determine the complementary colors according to lightness as well as hue and chroma. This is how colors are specified in the Swedish Natural Color System. Let's pursue two points. Hering claimed that the entire hue circle could be explained by binary mixtures of the four unique hues, which represented the "pure" sensation produced by one end of the opponent processes. In fact, Hering was both right and wrong. Imagine that we march through the spectrum, one monochromatic hue at a time, and for each wavelength we determine the wavelength of its exact visual complement. (This has actually been done, many times.) For nearly all green hues, we have to simulate the visual complement by a mixture of a "red" and "violet" wavelengths, but we can determine the proportion of r and b required to neutralize each green hue, and so measure the entire hue circle. Now we take a group of people with normal color vision and ask them to choose the wavelengths that best represent their unique hues. The diagram shows what we find. First, we discover that the unique hues are not visual complements. If we combine the "yellow" and "blue" chosen as unique hues, what we get is not a "white" mixture but a pale green. If we mix the unique "red" and "green" in the same way, we get a pale yellow. In other words, the Hering unique hues do not define the opponent processes. The r process seems to be anchored at a bluish red similar to carmine. The g process in contrast is not an actual green but closer to a turquoise or teal blue. The b process has a small amount of red mixed in it, similar to a cobalt blue. Only the y process seems to match the unique hue. The following table summarizes these differences as contrasting paint colors. The second point is that language is the worst form of color specification. Most people would probably call the scarlet hue in the example a "red" color. The complement to it would probably be called a "blue" color. So, in simplest terms, one would say that the visual complement of red is blue. But we've just seen that the opponent process green is closer to a teal blue or turquoise, so we'd be equally justified to say that the visual complement of red is turquoise. However, many people refer to a magenta as red, and the complement of magenta is a green: so we have the visual complement of red is green. Many attempts have been made to develop a hue circle that accurately represents our judgments of the perceived difference or contrast between hues, and most of these were developed without explicit consideration of the opponent contrasts. In all these hue circles, the unique hues are not opposing or complementary colors. But the unique hue names  red, yellow, green, blue  are the common coin for describing and explaining complementary colors in art textbooks. This leads to gross inaccuracies in talking about color. 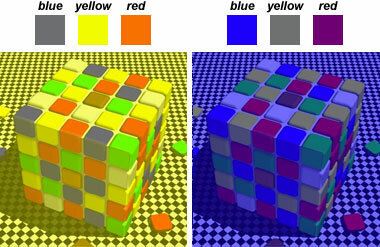 The complementary color relationships of negative afterimages are determined by the opponent coding of color receptors, as summarized in the basic rules of color vision. The simplest way to identify the visual complement of a color is to reverse its location on the r/g and y/b opponent contrasts (or the underlying LGN opponent curves). This is done simply by reversing the signs or polarity of the color's opponent coding. Orange (coded by the visual system as r+y+) is the complement of blue (coded as r-y-); middle green (r-y+) is the complement of red violet (r+y-), yellow (y+, rg=0) is the complement of blue violet (y-, rg=0) ... and so on around the color wheel. However, as Ewald Hering pointed out, negative afterimages appear at luminosity levels too low to produce receptor bleaching, and appear even when the eyes are closed and there is no contrasting background to make the receptor bleaching visible. So a second mechanism, neural rebound in the visual pathways of the LGN and visual cortex, appears to be involved. A general property of nerve cells is that, after a prolonged stimulation is ended, the cells "rebound" into an opposite state of inhibition. These effects produce changes in the apparent visual field even in the absence of successive visual stimulation. Negative afterimages do not displace or mask subsequent images in the visual field, so in all cases the background color of the successive visual field affects the apparent color of the afterimages. The normal situation is to view the afterimage over a gray or white background, which produces an undistorted color impression. Viewed over a colored background, the afterimage and background color will mix visually: a magenta square will produce a green negative afterimage, but seen against a deep blue background this green will appear to be a cyan or turquoise blue. To see this for yourself, try viewing the afterimage squares above over different sheets of colored paper. Successive Color Contrast. Subjective or psychological color effects were of interest in the 18th century, and among the most important of these were afterimages, which Michel-Eugène Chevreul and most modern color researchers term successive color contrasts. These early studies produced conflicting results (summarized by Chevreul) because there are in fact three different physiological mechanisms involved in successive contrast, and several different ways to produce the afterimage experience. Each produces a diffferent visual effect. Positive Afterimages. Positive afterimages result from brief, intense stimulation of the cones. The effect is easiest to see at night, in a room illuminated by a single, naked, light bulb. First look directly at the light blub, then quickly turn off the light. A glowing yellow or yellowish green image of the bulb will form in the darkness. Other common sources of positive afterimages are photographic flashes and specular solar reflections. These images form because of receptor afterdischarge. The intense light momentarily consumes a large proportion of the photopigment in the outer segments of individual cones, which causes a prolonged synaptic discharge (up to several minutes) from the affected cone while the photopigment is slowly replenished. Until this happens, the positive afterimage appears to mask or displace any new images in that area of the visual field. Photopigment in the L cones replenishes slightly faster than photopigments in the M or S cones, which causes the L receptor afterdischarge to attenuate more quickly. This produces an apparent change in hue (usually, a shift toward green or blue) as the afterimage disappears. Negative Afterimages. Negative afterimages result from prolonged, moderately intense stimulation of the cones. These produce far more complex and interesting visual effects. As simple demonstration: stare for 20 seconds at the white dot in the colored square on the left, then look away to the black dot on the right. After a moment (it helps to blink your eyes), a faint afterimage of the colored squares will swim into view  but the colors will be different. What colors do you see? then look at the black dot on the right. For most people, the colors in the afterimage are almost exactly reversed: the green turns magenta, the blue turns yellow, the magenta turns green, and the yellow turns blue. These illusory colors are the visual complements to the hues in the original image. This complementary afterimage also works for most other colors: an orange square will produce a blue afterimage, lime green will produce violet, and so on, all the way around Newton's color circle. Although a convincing yellow appears in this afterimage example, the overall image chromatic contrast plays a significant role in the illusion. To test this, I used Photoshop to create an image file of a square color area against a black background. After fixating for 20 seconds on a point along the top edge of the square, this layer was hidden to suddenly reveal a white square on a light gray background and, above it, a colored square that could be adjusted in hue, saturation and lightness to match the afterimage color viewed below it on the white background (diagram, right). Afterimages were generated in this way for stimulus colors at 30° invervals around the CIELAB hue circle, and both for stimulus colors at maximum saturation on a computer monitor and for stimulus colors at the same nuance (matched lightness and chroma across all hues). Two or three viewings were necessary to obtain a reasonable color match. The results are displayed below, with the afterimage color located opposite its stimulus color.  The saturation and luminance of the stimulus colors does not have a proportional impact on the chroma and lightness of the afterimage colors (within this arbitrary viewing context), and the afterimage chroma is low, in the range of C = 20 to 40. The main effect is in the brightness of the surround field; increasing field luminance (from black to gray) causes a decrease in chroma and a decrease in the lightness variations in the afterimages (image, right).  The afterimage hues lack any clear yellow or orange, but appear instead as mixtures of red, green and violet tints. In my experience, afterimages that should be more or less yellow appeared instead as separate red and green tinted squares hovering in the same place (or an ochre square with red and green fringes), an effect that disappears in predominantly red or green afterimages. It is as if, lacking both luminance information and chromatic contrast information, the visual system receives the L and M outputs but is unable to combine them into yellow.  The afterimage effect is not equivalent around the hue circle: a saturated blue does not make an intense yellow afterimage (viewed in isolation), but a dull yellow can make a relatively saturated violet; a saturated blue green makes a relatively dull red, but a saturated red makes an intense blue green.  The L contribution to the afterimage appears disproportionately larger than the M contribution, which causes all the afterimages produced by a green blue to purple stimulus color to appear much redder than the corresponding visual complementary hue to the stimulus hue. The difference between these two afterimage presentations indicates that, for isolated (unrelated) colors, the relative pigment bleaching and local adaptation of the L, M and S cones has the dominant role in generating afterimage colors, and these shifts seem to report through chromatic rather than luminance channels. For multiple (related) colors, the opponent dimensions higher in the visual system can exert an effect that increases the saturation and lightness contrast of afterimage colors, producing a vivid yellow sensation. Isolated afterimages somehow disable this integrating function and foreground the red vs. green component. Afterimages and Color Harmony. It's worth mention that the phenomena of negative afterimages was one of the cornerstones of 19th century color theory. Shown a patch of yellow, the eye retained the image of blue. This was taken to represent a fundamental tendency of the eye to "seek balance" or to make a color compensation. On this basis the concept of "color harmony" as a balance between these antagonisms arose. The opponent process explanation for contrasts was unavailable in the 18th and 19th centuries, so it is typical to find instead an "eye animism" or eye volition, for example in J.W. von Goethe's claim that complementary color afterimages arise because the eye seeks "to experience completeness, to satisfy itself." The erroneous assumption that the eye was demonstrating a desire or need for color balance invited the conclusion that complementary colors are the most harmonious (satisfying) color pairings possible. The fact that they canceled to make gray was taken as proof of the inherent balance. Indeed, in the 19th century it was suggested that all the colors in a perfectly harmonious painting, if spun rapidly like a color top, would produce a perfectly gray blur. Suppression and Enhancement of Afterimages. If afterimages can happen so easily, why do we not see them all the time? The answer is that afterimages are simply suppressed or written over by new images formed in vision. However, they can be enhanced by a successive image similar to the first. 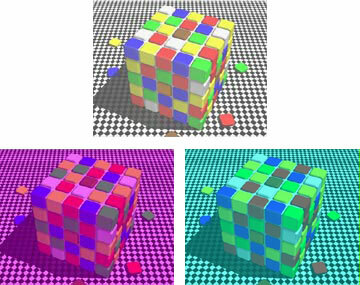 In the example above, the afterimages of the colored squares appear clearly when seen over the gray background. They disappear when seen over the conflicting colored background (at left), as this simply overwrites the previous image. But the afterimage is enhanced  appears more quickly and brightly  when viewed against a background image of similar gray squares (at right). In normal visual experience, succeeding images on the retina are sufficiently different from the previous ones that afterimages don't conflict with what we see in the present. Corresponding Colors. The fact that the same color can appear to be a different color under a different illumination or adaptation invites the location of two different colors that will appear to be the same color under different illuminations, that is, metamers produced by adaptation. These are called corresponding colors. How do you compare colors before and after chromatic adaptation? One method is memory matching: viewers study the appearance of colors in a color atlas, then rely on memory colors to describe the appearance of adaptation colors. A second is binocular matching or haploscopic matching, in which the "before" and "after" color stimuli are presented separately to the left and right eye, aligned to appear side by side. A third is to use prompt color matching during the brief period of successive color contrast. An important point is that chromatic adaptation is not simply a "color shift" equivalent to changing the chromaticity of the color stimulus. That is, if a test color can be exactly matched by a mixture of three real "primary" lights before chromatic adaptation, the appearance of the test color after chromatic adaptation sometimes cannot be matched by any mixture of the "primary" lights or even by any physical color stimulus of any kind. The problem with haploscopic matching can be illustrated by example. The problem with memory matching can be illustrated by analogy: we turn the color matching task into a geography matching task. Viewers first memorize a map of the USA, then use their memory of the map to name the state underneath "adapted" geographic locations. The problem is that viewers can sensibly locate a state, but cannot by that procedure describe a fundamental change in the map. The thumbnail at right shows measurements of human color perceptions under two tinted illuminants, a bluish "daylight" illuminant known as CIE illuminant D65 (for daylight at a correlated color temperature of 6500°K), and a yellowsh incandescent tungsten illumination (with a correlated color temperature of about 2860°K), known as CIE illuminant A. This graphic is an attempt to render the colors for comparison with a background tint to suggest the illuminant hue. A simple demonstration of the inaccuracy of computing corresponding colors is provided at Bruce Lindbloom's color management web site. The second major area of subjective color experience, researched primarily in the 19th century, is the simultaneous color contrasts produced by differently colored areas viewed side by side at the same time. These effects are among the easiest and most convenient to reproduce from household materials, and for that reason many classic color theory books, from Chevreul to Albers, describe them at great length. Chromatic Contrast. The observation and explanation of simultaneous contrasts in the traditional color theory literature are distorted by two serious flaws. The first, experimental flaw is that these effects were traditionally analyzed by opposing some "colors" to other "colors," without separating the three colormaking attributes  lightness, chroma and hue  as independent contrast elements. Underlying this approach was the prejudice that hue was the key component to the contrast effect. In fact, when the three colormaking attributes are considered separately, we find that hue is the least potent visual contrast of all. The second, logical flaw is in the assumption that the "tension" or "conflict" between one complementary color pair is pretty much the same as any other. As we will see, this is simply not true. The supposed fundamental "tension" between two colors has a qualitative impact that depends a lot on the specific values, intensities and hues involved, and is highly sensitive to the overall color context. This illusion is normally demonstrated using different shades of gray, to cancel the effects of hue and chroma. But the example shows that it also works for shades of blue (or any other color) that have exactly the same hue and chroma, but differ widely in luminosity. Within each large square, the average lightness is based on the outer and inner squares. Contrast is increased around this local average, shifting the apparent value of the smaller squares in opposite directions. This also means that the two larger squares both appear darker than they would in other settings, because they are shifted to contrast with the white background of the page. This value shift is the easiest visual illusion to elicit. In fact, many people will not believe that the two central squares are really the same lightness. The illusion is so powerful because value dominates our visual experience, a fact we will explore later. Crispening Effect. A special case of lightness contrast is the crispening effect, which increases the apparent contrast between two colors of similar lightness against a surround lightness of value between them. The schematic at right shows the basic effect: the perceived lightness contrast between grayscale steps amplified around the average lightness of the background. All the lighter values are compressed slightly toward white, and match the nominal white at the lightest step of the scale; the darker values are compressed slightly toward black. This shift is strongest within a one half Munsell value step on either side of the background value, and then becomes constant for the rest of the scale. In the diagram, the pair of rectangles differ slightly in value, but have the same values across all examples. However, the differences between them are most visible when they are displayed against a gray background; when the background is white or near black, these differences are obscured. Bartleson-Breneman Effect. A related effect appears in the perceived contrast among areas of different value within an image when the image is viewed against a light or dark valued background. The Bartleson-Breneman effect is well known in imaging studies: as the background becomes darker, the induced lighteneing in the image (called the "complex stimulus") causes all the values to appear lighter; but this has the greatest impact on the darkest values, which compresses the value range and makes the steps between gray values appear smaller. Against a light valued background the lightness contrast causes the image values to appear darker, but again this has the greatest impact on the darker values, causing them to darken and causing the value steps between grays to widen. In this example, the value series on the left appears closer together because the background or surround is very dark. On the right, the same values appear more greatly contrasted because the surround is relatively light valued. Note that the induced change becomes more noticeable as the values get darker. Watercolor painters, especially those who build up images through several layers of paint, are familiar with this effect. The first, light valued glazes on white paper appear to have darker values and greater contrasts in value than desired. However, as the image is built up, and these first layers are surrounded by darker valued areas, the original layers become compressed toward the lighter end of the value scale. They appear lighter valued, and the value steps among them appear more subtle. Painters who apply the first layers so that they appear "just right" against the white paper are usually disappointed to discover that they become faded and too light once darker values are added to the painting. What is the optimal illumination level for the best overall sensitivity to reflectance differences, for example in the gray values of an etching, photograph or halftone image? The graph (above right) indicates this is around a surface luminance of a few hundred cd/m2, which as it happens is the approximate maximum ("white") luminance emitted by a typical computer monitor or the average luminance emitted by a brighter color television set, which are both best viewed under subdued ambient lighting. To get similar luminances from reflecting surfaces, an ambient illumination level of several hundred to 1000 lux is necessary  the typical illumination used in "high demand" task settings such as microelectronic assembly or surgical theaters. Noon sunlight can actually be too bright, as you can verify by viewing a low contrast photographic print or a faintly smudged piece of white paper under direct sunlight, shade (skylight) and indoor light at different times of the day. Chroma. The next strongest visual effect is the apparent shift in chroma of identical colored squares. In the illustration, the central squares are moderately unsaturated (chroma 55), and the surrounding colors are either dull (chroma 30) or intense (chroma 100). All squares have exactly the same lightness (L = 60) and hue (red violet). These unexpected apparent value shifts  unexpected because the larger squares are exactly the same lightness and hue  occur because the violet on the right seems to be a brighter color. The eye incorporates this information in the darkness it attributes to the inner squares because value and chroma are often confused in color perception. As I mention in my review of Michel-Eugène Chevreul's Principles of Color Harmony and Contrast, the effects of lightness and chroma were often confused in painting terminology and practice from the Renaissance through the early 19th century. Painters could certainly tell the difference between intense and dull colors, and could reproduce colors within the range of their historical pigments; but chroma and lightness changes were manipulated by "breaking" the colors with some combination of black and white paint, which altered both lightness and chroma at the same time. You may notice a fuzzy or vibrating quality at the border between the high chroma and gray squares (at right). Although I know of no research to confirm this, I believe visual edge detection is much less effective at the boundary between chroma contrasts than lightness contrasts, especially if the lightness contrast between chroma differences is small (as in the example above). In fact, this indistinct boundary seems to contribute to the "glowing" effect of high chroma color fields. Helmholtz-Kohlrausch Effect. We can bring into this overview of luminosity shifts in color the fact that increased chroma increases apparent color luminosity, which is known as the Helmholtz-Kohlrausch effect. This applies both to lights and to object colors, and is a kind of reciprocal statement of the Hunt effect. The Helmholtz-Kohlrausch effect is especially confusing when artists attempt comparisons of color lightness or value between two intense hues or between an intense and muted color. For that reason it is explored further in the discussion of hue, lightness and chroma. Finally, the central square can be surrounded by colors contrasted in hue but identical in chroma and lightness. According to color theory, a complementary shift in hue should appear. In practice, I've found this hue shift is hard to demonstrate. After a lot of experimenting, I found a contrast that does seem to work: a smaller square of green within larger squares of yellow and turquoise (all squares have a lightness of 90 and chroma of 80). Unfortunately, I don't see anything like those hue shifts here; the central squares seem roughly the same hue to me. In fact, the small green square on the left looks more intense, lighter valued, and shifted slightly toward yellow  even though color theory predicts it should appear less intense and shifted toward blue violet. This color shift is what we would expect in a chroma contrast, and it may happen because the chroma of 80 is enough to make the yellow appear duller than the turquoise, even though the lightness of the two colors is the same. Here is another example, this time with red violet against orange or blue. In this example the hue does seem slightly bluer within the orange square, but again the predominant effect seems to be a lightness or chroma shift, making the left square appear brighter and more intense than the right. The difficulty in finding a hue contrast that works on its own arises because the relationship between chroma and lightness changes radically from one hue to the next, and the eye tends to overestimate the lightness of some hues (deep reds and blues) and underestimate the lightness of others (yellows and greens). With all that going on at the same time, it's not easy to find three contrasting hues that can be subjectively equated on both chroma and lightness. With few exceptions, the color theory books you'll encounter do not bother with these distinctions, and therefore mislead you on the true nature of visual contrasts. But I repeat: hue is the weakest component of visual contrast, when compared with the impact of lightness and chroma. According to Rood, the shift color (the color in the central square, which can be expected to shift) should be unsaturated and mid valued, and it should be surrounded by a single strongly saturated color. If the shift color has a high chroma or is either very light or very dark valued, the apparent shift is usually reduced. Hue contrasts will also vary depending on the relative color distance between the two contrast colors (in this, case, between the central square and its background): a greater color distance should produce a larger color shift. Here's the previous hue shift in "enhanced" form  complementary background colors, and neutralized central squares  so you can judge the difference for yourself. I see primarily an apparent value or chroma contrast between the two central squares, with a small hue shift toward blue in the square surrounded by orange, and toward yellow in the square surrounded by blue. But, again, the hue shift by itself is very small. It seems to me a measure of the ignorance and bias inherent in the writings of Johannes Itten, Faber Birren and other popular color theory writers that they make so much of "color" effects that depend so little on hue. It turns out that humans do not have color constancy, if that means the ability to recognize or distinguish colors across a wide range of illuminants. Instead, a rich system of beliefs about the world  the behavior of light, colors at different times of day, remembered colors of familiar objects  impose themselves on color sensations in a way that is typically involuntary and unconscious. Our color experience seems consistent even though it is changing all the time, minute to minute. Simply by looking from a computer monitor toward a sunny window, or by walking from a doorway into the open air, or by watching heavy clouds clear into radiant moist sunlight, we discount color change by experiencing it as a change of light or context. Color becomes inseparable from form or illumination. It condenses onto physical forms or dissolves into lights. Greens become lawns and blues become skies; color fuses with the material world. But color must also keep its place. It must still follow the principles of related colors and colormaking simplification. If it is lawn, the green must stay lawn even when it is in shadow or raked by reddish light. It has a visual identity akin to its color under the best light, even when that light changes. This is color constancy. Humans absolutely do not have color constancy in the sense that "colors look the same" all the time, because otherwise we would not notice that light had changed. But we do have color constancy in the specific sense of altering or interpreting changes in color as changes in light  specifically as changes in the color and intensity of illumination, or changes caused by transparent or filtering media such as fog, smoke or tinted glass. Color recognition is anchored fundamentally in a range of ideal colors that have the status of abstract concepts: the color invoked when someone asks you to imagine the color red. Ideal colors are necessary for managing the translation of sensations into color labels and color labels into a decision or behavior, but they are not sensations and they have a very vague relationship to color experience. For example, once you have imagined the color red, it is rather odd to be asked "how bright is it?" And the word "red" can be applied to very different colors  an apple, a sunburn or a glass of wine. In contrast, attached to many objects is a remembered color or memory colors that participates in recognizing the object or noticing a change in its appearance or condition. Memory colors can be quite specific (the color of your partner's hair or skin), or rather general (the color of grass, or the color of cheese); they are also dependent on the illumination under which they have typically been seen. Memory colors are not attached to language but to object concepts, so they often cannot be described precisely because they do not match the ideal color categories of our language. It is perfectly natural to say "how bright" is the color of the sun, and it is not unusual to use the memory color of one object to describe another object  a school bus may "be the color of" a California poppy, or a good cheddar. The Ambiguity of Images. When color becomes the world, it divides into four primary forms. The first and dominant is the ambient light source or illuminant. Without the illuminant, nothing else would be visible. It is almost always the largest and brightest light, even if it is diffuse, indirect, or dim. And it is always colored, because it has a unique spectral power distribution. But surfaces are what we see, and surfaces can and do transform the color of the illuminant. Light and surfaces mix subtractively, just like paints. These mixtures tell us both about surfaces and light, but our vision is designed to ignore the effects of the illuminant as much as possible, which is why we may not notice we are in a dim room until we try to read, or not notice that the light is red until we see the sun is low in the sky. In most natural environments the brightness of surfaces is substantially brighter than the sky, and surfaces at a middle gray lightness (around 20% reflectance) usually determine the light adaptation. The third color quality, the transparent medium, is both the quality of air and scattering substances such as water, fog or rain, smoke or dust, or artificial materials such as glass or plastic. This may darken, whiten, iridesce, hue shift or hue enhance the colors of surfaces under light, and is typically a quality we attribute to the atmosphere or tinted glasses. All objects that are already known to us from experience, or that we regard as familiar by their color, we see through the spectacles of memory color. A key part of this process is discounting the illuminant, which occurs when we can consciously perceive that a color area has a changed because of the color of the illumination or a transmitting filter, yet we are able to ignore the color change because (1) the color change is global and constant, and (2) the surface color, or the color change in context, is familiar to us. The simplest example of discounting the illuminant occurs when we put on sunglasses. These change both the lightness and color of surfaces, and we are immediately able to ignore these changes, then forget we are ignoring them. (As this example shows, discounting the illuminant is a misnomer, since we can also discount tinted media.) More dramatic examples can be manufactured by radically shifting the color balance of photographic images or simulations of images that we have never seen before. Here for example is the same multicolored cube viewed as if under light or through a transparent medium tinted either yellow or violet. There are several remarkable aspects to this. We immediately achieve a very firm conviction about the "real" colors of the cube, even though we know the colors are distorted and we have never seen the cube before. We are fully conscious of the strong overall tint, yet ignore it. And our actual sense data contradict our color interpretation: we see the "same red" in tiles that are either orange or purple. In fact, astonishingly, we see "different yellow or blue" in tiles that are an identical, perfectly neutral gray! Seems impossible, yet there it is. However, if we place these impossible color shifts in their general relationship in a hue circle, with white at the center, a pattern emerges. The red, green and white have all shifted from yellow to blue, or warm and cool, and the opposing yellow and blue have radically increased or decreased in chroma. So we disregard the local color changes because they conform to a simple scheme: colors along the path of the hue shift change in chroma, while colors on either side change in hue. This is the general pattern of an illuminant color shift, and is produced every day by daylight phases, from dawn to noon to dusk. Equally powerful deceptions appear when the principal contrast is in illumination. The example at right shows a cube tiled with yellow dots, with a blue dot at the center of each face. What is remarkable is that the blue dots have an identical lightness and chroma in the image, while the contrasting values of the cube faces make the dot appear luminous on the dark side and close to black on the bright side. Despite these strong apparent differences, the lightness of each blue dot is the same, as you can confirm by downloading the image into an image processing program and measuring the dot values with a color picker. These are changes in light that arise from the intensity and direction of light, whose color effects we also see clearly and ignore. They are interpreted into the shape of objects and their ability to occlude light. Thus, color constancy is primarily concerned with the coloring and shadow casting effects of illumination. The example chosen by Purves is to some extent special pleading, because the recognition of colors is most accurate when they are displaced along the y/b opponent function. The example below shows the same cube under simulated magenta or cyan illumination, which has a significantly different effect. The magenta illuminated cube, remarkably, retains the hue contrasts and makes some colors more chromatic. It also makes the colors more equal in lightness, which obscures value contrasts. The cyan illuminated cube darkens or lightens colors in a way that increases the value contrasts but obscures the hue differences: green, yellow and white, or blue, brown and red, now resemble one another. Again, a crude hue circle presentation of the contrasts shows this effect as well. In general green is a value enhancing illuminant, distorting hues but making lights and darks stand in stronger contrast, while magenta is a hue enhancing illuminant, distorting value relationships but keeping the hue differences relatively unchanged. Qualitative Contrast Differences. If we use our judgment and contrast painting colors on chroma and lightness as well as hue, then placing visual complements side by side can create a very powerful tension within an intricate pattern or between large areas of color. In particular, pattern contrasts often produce a kind of color vibration or energy between the two colors, especially at the boundary between two intense colors that are relatively similar in value. Suggestions for Painters. Translating the colors of twilight or night into a painting that is viewed at gallery lighting levels is a complex problem. A dark background or mat and a dark frame are essential, as it reduces the image contrast. The painting should hang in subdued lighting, keyed to barely reveal the darkest value differences. No color vision is purely achromatic, so a night painting in pure black and white appears colorless. It is customary to represent night scenes with a dark blue violet sky, very dark silhouetted objects and deep yellow emanating from windows viewed from outside. Color research indicates that the scotopic tint cast over all colors is probably best represented as a very dull cyan or cerulean blue. However, the trezona primaries suggest that magenta, deep blue and green, at very low chroma and contrast, form the color foundation of a scotopic palette. Warm grays or browns should be used to render red or orange objects, dark blue green to represent greens and blues, and a pinkish gray to represent yellows, ochres and yellow greens. The value contrast between light and dark colors should be cut by at least half, and the lightest surface colors should appear to be a medium to light gray. White and light valued colors should stand out with greater contrast from black and dark colors than they do under daylight illumination  by reducing the number of intermediate grays. Dark purples should appear the same value as black. Scenes that represent mesopic luminance levels, such as twilight, should represent approximately the normal color range, but biased according to the color shifts described above. Reds remain relatively more prominent until close to the low mesopic threshold. All yellows and yellow greens turn ochre just below the upper mesopic limit, where oranges, reds and magentas appear slightly brighter and whites take on a delicate pinkish hue. For landscape painters, it is very useful to examine the mesopic and scoptopic color changes in a set of color swatches, or in color photographs or magazine reproductions of landscape scenes, to memorize the color shifts it is necessary to capture in paint mixture. The green/magenta balance is often important to guide color choices and color harmonies to represent darkness, but also atmosphere. Luminance Effects in Painting. Painters are especially familiar with these effects in landscape lighting. The example a is well known to backpackers, who notice the increased brilliance of a white shirt against a gray scree as sunlight breaks through after a storm. (Thomas Girtin captured a related effect in his White House at Chelsea.) The opposite effect is common in adobe houses, whose windows appear as a similar gray to the walls in the morning, but darken to black during the hot light of afternoon. Landscape painters must cope with both the Stevens and Hunt effects when they work outdoors. It is common to see novice plein air paintings that have relatively dark, dull, subdued color  and for the painters to feel disappointment in the appearance of their landscapes in the studio. What went wront? The problem is: they were painted in bright outdoor light! At high luminance levels outdoors, the Stevens effect makes paint value contrasts appear very strong, and the Hunt effect makes the colors appear very intense. To match the landscape colors, the painter subdues his paint mixtures. But when the same colors are viewed under gallery level lighting, they appear muddy and dark. This problem left many footprints in the landscape tradition, and is especially obvious in the rather dark, muddy landscapes by Corot, Pissarro and others. Monet's famous paintings of the Rouen cathedral, viewed through the window of a north facing and relatively dark room, were probably in part an attempt to understand and grapple with this problem.  make the overall key or average value of the painting lighter, compared to the brightness that appears in the landscape. How much should the value key, contrasts and chroma be exaggerated? This depends on the weather, time of day and landscape, but as a general rule a one third increase in the middle values (for example, from a mid valued 5 to a lighter valued 6.5), and a 50% increase in chroma and lightness contrasts, is a reliable baseline for daylight on most clear days. On overcast days, or when the sun is low, the exaggeration should be reduced. When these "exaggerated" works are viewed under comparatively subdued gallery lighting, the Stevens and Hunt effects will pull the colors back toward the values that the painter wanted to capture in the landscape. This is the painter's paradox: to bring the landscape indoors, you must not "copy" the landscape colors! However, this "tension" or vibration is not the same for all complementary hue contrasts, as the following examples demonstrate. As you examine these color patterns, look at four things: the crispness or distinctness of the edge between colors at the thinnest color bands; the overall visual harmony or conflict between the color pairs; the ability of the colors to invoke a representational illumination or mood; and the relative power of the contrast to convey a three dimensional form (a fluted column). Some of the strongest (and to my eye, most unpleasant) color tensions arise between red and turquoise or magenta and blue green (top and bottom rows, far left), colors that are at opposite ends of the very powerful r/g opponent contrast. This contrast seems also to be visually the most unstable, as it produces a kind of visual fluttering or vibration when the colors are closely spaced  the reason why intense reds and blue greens are rarely used against each other in text. By comparison, the combination of violet and yellow green (bottom row, right) seems visually much less active and emotionally more stable and restful. And natural light seems invoked by the contrasts with yellow or orange (top row, right and center). (For further discussion of color contrasts and visual design, see the pages on full color harmonies and near neutrals and color design.) Principles of Chromatic Adaptation. In his 1879 book on color science, Ogden Rood suggested a simple method to anticipate these color changes. This is adapted from the more general principles laid down by Michel-Eugène Chevreul and embodied in his color hemisphere. You first of all need to identify a target or key color that is the source of the color shifts. For example, you may be painting a Buckingham Palace Guard in his bright red coat, and want to know the effects this color will have on adjacent colors in the image  the guard's face, gold epaulets, the foliage green background, the blue sky, whatever.  Analogous hues. Colors of a similar hue to the key color show little hue shift but will appear desaturated (shifted toward the center of the color wheel). A middle red will make red orange or magenta appear duller.  Quadrant hues. Colors at approximately 90 degrees on either side of the key color will show little change in apparent chroma, but large hue shifts away from the key color toward the key color's complementary hue. A middle red will make blue violets shift toward blue and yellows shift toward yellow green.  Triad hues. Colors diagonally opposite from the key color will hue shift away from red and increase in chroma (shift away from the center of the wheel). A middle red will make a green or middle blue appear more intense and cooler.  Complementary hue. The key color's complementary hue (teal blue) will show no hue shift, but will appear more intense. So goes the theory. In practice, this calculation is not equally accurate for all hues around the color wheel. To take one example, middle yellow is already one of the most intense watercolors, and its complementary hue (close to cobalt blue) is typically darker and relatively dull. For these reasons, the simultaneous contrast shifts experienced in yellow placed next to blue will be relatively muted, because yellow is already near the visual limit in chroma. Similar complications arise across the same hue at different values or intensities. Because chroma and lightness are so important, the better approach is to visualize the two contrasting colors as located in the three dimensional CIELAB color space. The general rule is then: simultaneous contrast moves colors farther apart on the L*, a* and b* dimensions. The difference in lightness (L*) and chroma between colors will always increase, especially if their values are similar; colors will appear to separate in hue. In general, the eye adapts to increase the perceptual contrast or apparent range of any gamut presented to it, to make the most of perceptible color differences in the scene. A light emitting computer color monitor is less effective to display these color shift effects than reflective artists' materials viewed under room lighting. For that reason I urge you to conduct your own complementary contrast experiments with colored papers. I find that common origami papers are brightly colored and varied enough for many interesting color contrast experiments; these papers can be mixed and matched with the heavier weight and traditionally more unsaturated colored construction papers (craft papers). Always test different color combinations or color constructions under different types of lighting: sunlight, incandescent and fluorescent light provide the most variation.  Simultaneous contrast effects due to either value (lightness) or chroma are much stronger and more common than contrast effects due to hue alone.  Most color theory demonstrations with colored squares confuse the colormaking attributes, attributing to hue effects that are created primarily or entirely by differences in lightness or chroma.  The strength of simultaneous contrasts is dependent on hue: the contrast between blue green and red is different in strength and subjective effect from the contrast between yellow green and violet.  Much depends on the visual context and the actual materials; simplistic color theory generalizations will fail in many specific applications. The last two points deserve emphasis. Nothing is gained through simplistic, geometrically symmetrical rules of color combination. Nothing is gained by ignoring the unique effects possible by combining different hues. The eye's contrast enhancing behavior surely indicates that artists must attend to color contrasts when making a picture. But what exactly have we inherited from traditional color theory? As explained in the section on Newton's color circle, the phenomenon of complementary spectral hues  colors that mix to white  seemed to offer an objective "color logic" that could clarify color relationships after centuries of color confusion. These contrasts also appeared spontaneously in carefully contrived simultaneous contrast patterns, in successive contrast or afterimages, and in chromatic adaptation, so their effect was recognizably significant. All this contributed to make complementary color contrasts an idée fixe with 19th century "color theorists" and their Bauhaus progeny. More than a century later, we can ask: how much of that emphasis is deserved? To my mind, the fixation on complementary color contrasts above all other color contrasts seems misplaced and overblown. We no longer need to be panicked by color confusion or resort to simplistic geometrical contrasts to build color ideas. These ideas should never distract us from actually looking at color to evaluate its impact  for example, a more general pattern of color harmony appears in triadic hues separated by roughly one third the circumference of the color wheel. And finally, in actual paintings, these simultaneous contrast shifts in hue, chroma or lightness can be easily negated by adjustments in paint mixtures and by the overall color context. In short: relax the grip of color theory dogma on your mind and experience color effects without preconceptions. Simultaneous color contrasts don't indicate visual biases that must be compensated for, or rules that must be obeyed: they identify one among the many aspects of color that can be used to enhance an already effective design. Books that intelligently address color design issues are hard to come by. Wucius Wong's Principles of Color Design (John Wiley & Sons, 1997) is one of the more comprehensive, with discussion of electronic (computer) design issues. However, it suffers from adherence to the traditional color wisdom, which I've just shown is an inadequate approach to color effects.